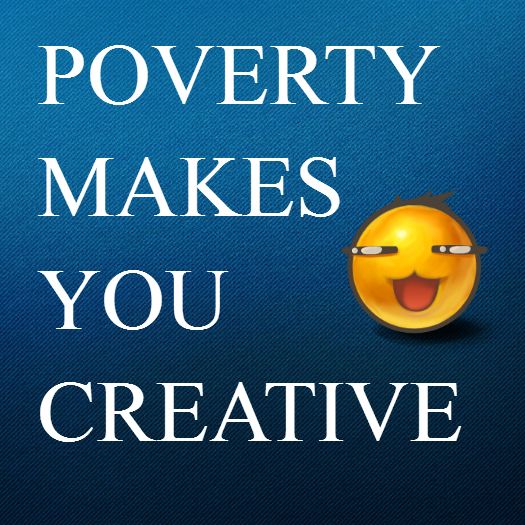 DO YOU KNOW POVERTY MAKES YOU CREATIVE? This may sound funny or stupid but think about it. Remember the times you didn’t have money and you needed to do something, you were forced to think. You were forced to look deep within yourself and think of ways you could make money. There are some of us that would never amount to anything if we didn’t face trying times; if we didn’t go through unpalatable situations. Some people went into business, some became writers, some learnt skills, some wrote books, some became motivational speakers, but these people wouldn’t have known they could do anything extraordinary or made something of themselves if they didn’t go through periods of lack and want. Poverty makes you look within yourself, makes you rediscover who you really are. Makes you disciplined, makes you more selfless and more emphatic. Don’t disregard the challenging seasons; you never know what it would produce in and through you. If not for anything, I think you should thank God for those times; times when it seems financial doors have been closed to you. God takes his strongest soldiers through the toughest times. If you are facing hardship today, be sure of one thing, you have been created for so much more. Greatest lies ahead of you, just don’t give up. I am rooting for you. CAN YOU LIVE WITH YOURSELF FOR THE REST OF YOUR LIFE? Haha the title sounded funny. It is actually true as far as the poverty doesn't last longer than it should. Lol, I know right. The title looks weird. I love your contribution, thank you for sharing your thoughts. Yeah, thank you for sharing your thoughts. Sexuality: Is the Battle Lost?